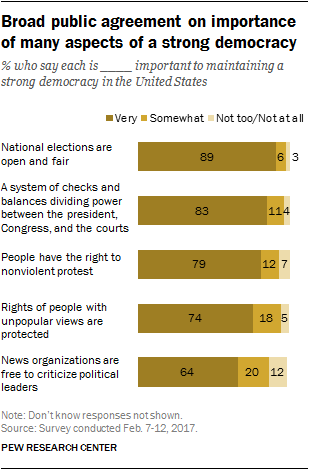 Large majorities of the public, Republicans and Democrats alike, say open and fair elections and a system of governmental checks and balances are essential to maintaining a strong democracy in the United States. However, there is less consensus about the importance of other aspects of a strong democracy – notably, the freedom of news organizations to criticize political leaders. The survey by Pew Research Center, conducted Feb. 7-12 among 1,503 adults, finds that 89% say fair and open national elections are very important to maintaining a strong democracy, while 83% say the same about a system of checks and balances dividing power between the president, Congress and the courts. As in past surveys, most also view the right to nonviolent protest (79%) and protecting the rights of those with unpopular views (74%) as very important components of a strong democracy. A smaller majority (64%) says the freedom of news organizations to criticize political leaders is essential to maintain a strong democracy in the U.S. The survey also finds that there is little appetite among the public for increasing presidential power relative to the other branches of government. Just 17% of Americans say that “many of the country’s problems could be dealt with more effectively if U.S. presidents didn’t have to worry so much about Congress or the courts,” while 77% take the view that “it would be too risky to give U.S. presidents more power to deal directly with many of the country’s problems” – including sizable majorities of Democrats and Democratic-leaning independents (87%) and Republicans and Republican leaners (65%). For the most part, views of the important components of a strong democracy have changed little since October, late in the presidential campaign. And the partisan differences that were evident then persist today (the item about governmental checks and balances was not included in October). Nearly all Republicans and Republican-leaning independents (92%) and Democrats and Democratic leaners (90%) view open and fair elections as very important to maintaining a strong democracy. In addition, large majorities in both parties (83% of Republicans, 85% of Democrats) view a system of checks and balances as very important for a strong democracy. Republicans (68%) are less likely than Democrats (88%) to view the right to nonviolent protest as very important. Similarly, while majorities in both parties say it is very important that the rights of people with unpopular views are protected, fewer Republicans (66%) than Democrats (80%) say this. The sharpest partisan disagreement is over the importance of the freedom of news organizations to criticize political leaders. 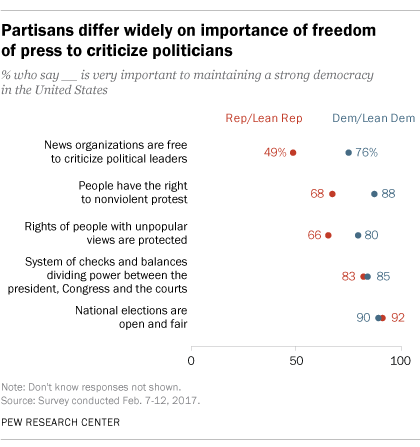 About three-quarters of Democrats (76%) say the freedom of the press to criticize politicians is very important to maintaining a strong democracy; only about half of Republicans (49%) say the same. Those 65 and older are somewhat less likely (69%) than those younger than 65 (75%) to say that protecting the rights of those with unpopular views is very important for maintaining a strong democracy. 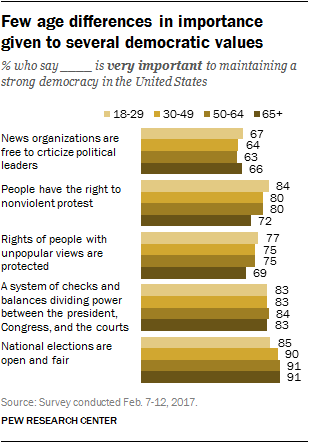 And a similar age gap is evident when it comes to protecting the right to nonviolent protest (72% of older adults, compared with 81% of those under 65 say this is very important). There is little difference across age groups in the importance given to checks and balances, open and fair elections, and press freedom to maintaining a strong American democracy. Across the board, those with higher levels of education are significantly more likely to consider each of these values very important to maintaining a strong democracy. And these educational gaps are found within both parties: For instance, while 74% of Republicans with a college degree say it is very important to protect the rights of people with unpopular views, a smaller majority (63%) of those without a college degree say this. Among Democrats, 92% of those with a college degree say this, compared with 74% of those who have not graduated from college. 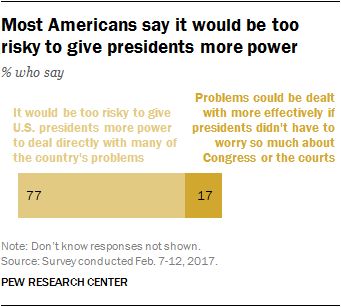 Americans overwhelmingly think that it would be too risky to give U.S. presidents more power to deal directly with many of the country’s problems: 77% say this, while just 17% say that problems could be dealt with more effectively if U.S. presidents didn’t have to worry so much about Congress or the courts. When a similar question was asked six months ago, a wide majority also expressed skepticism about increasing presidential power (77% now, 72% then). 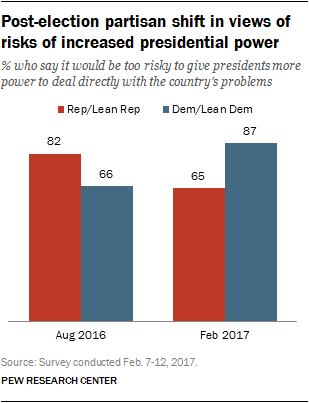 The sense that increasing presidential power would be “too risky” has grown among Democrats since August, when Barack Obama was still president: While a 66% majority said giving presidents greater powers would be too risky in August, nearly nine-in-ten (87%) now say this. Conversely, while 82% of Republicans expressed concern about increasing presidential powers relative to the other branches of government in August, a smaller majority (65%) say this today.